Transmitters | Veronics Instruments Inc. The HygroPro is a loop-powered, intrinsically safe moisture transmitter for measuring the moisture content in gases and non-aqueous liquids in pipeline natural gas, petrochemical, power generation, pharmaceutical, process, and industrial applications. The HygroPro features an aluminum oxide moisture sensor, temperature thermistor, and pressure transducer built on a single probe mount to provide real time measurements for the calculation of parameters such as ppmv in gases, pounds per million standard cubic feet in natural gas, ppmw in liquids and percent relative humidity in addition to dew point temperature. Each sensor is individually computer-calibrated against known moisture concentrations, traceable to NIST. Sensor recalibration by GE is recommended every six to twelve months depending on application. 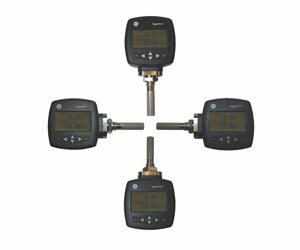 The MMY30 is specifically designed to measure dew point or ppm at line pressure or atmospheric pressure for control of desiccant air dryers. These benefits apply to both dryer users and manufacturers. The MMY31 mounts directly in-line for applications such as glove boxes, where a bypass is not appropriate. It is easily installed via a 1/2″ MNPT or G 1/2 adjustable insertion length compression fitting. Applications include glove boxes, environmental chambers, and high altitude testing. The Veridri Moisture Transmitter provides Dryer Manufacturers and other OEM’s with the means to make simple accurate and reliable moisture measurements with a wide variety of Dewpoint ranges.